(November 6, 2016) Early Voting finished on Saturday, and 19,672 people voted at the Steele Creek Early Voting Site at York Ridge Shopping Center. This was the fifth busiest site among the 22 sites in Mecklenburg County. The last day to request an Absentee Ballot was November 1. If you have an Absentee Ballot, it must be returned to the Board of Elections by 5:00 p.m. on November 8 by the voter or the voter's near relative. Ballots sent by mail must bear a postmark that is dated on or before November 8 and be received no later than 5:00 p.m. on the third day following the election. Since the third day following the election is a holiday (Veterans Day on November 11) it appears that Absentee Ballots must be received by Monday, November 14. See the North Carolina Board of Elections web site for more information. Note that the voting location for Precinct 77 remains at the old Nations Ford Elementary School at 8300 Nations Ford Road even though this school has been closed and a replacement school opened this school year next to E. E. Waddell Language Academy. To see your sample ballot, confirm your precinct, and see a list of your districts, go to the Address Search page and enter your address. For more election information, visit the Mecklenburg County Board of Elections or North Carolina State Board of Elections web sites. See also Know Your Districts for the 2016 Election. 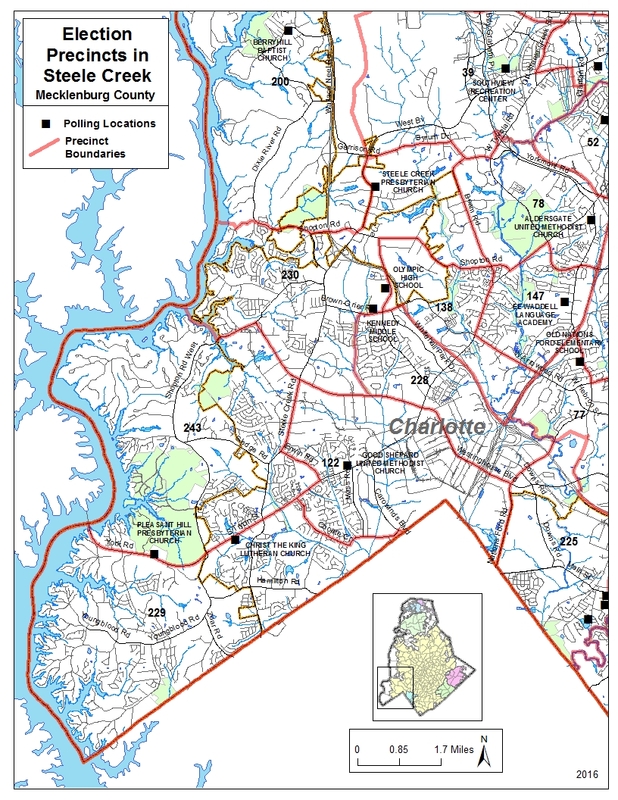 If you live within the Charlotte city limits, you will see three bond issues on your ballot. See Neighborhood Bonds will Support Steele Creek Projects.